Ubisoft’s best-selling Assassin’s Creed game franchise is one-upping its usual annual release schedule, with not one, but two new AC games hitting shelves this fall. But Ubisoft is hoping to expand the franchise’s success beyond our game consoles and computers. 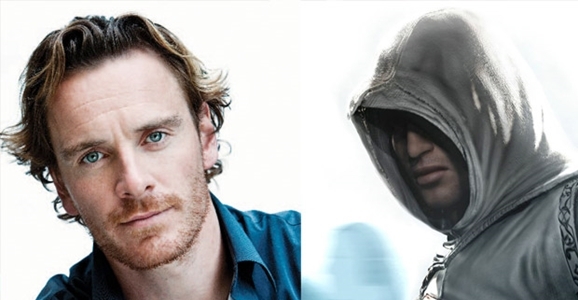 An Assassin’s Creed movie is currently in the works, with Michael Fassbender (Prometheus) set to star. While the flick isn’t due in theaters until next summer, a new interview with Fassbender reveals how respectful they’re being of the source material and what appealed to him about the project. IGN caught up with Fassbender while the actor was promoting his drama/comedy Frank, which also stars Domnhall Gleeson, Maggie Gyllenhaal, and Scott McNairy. It’s been awhile since we heard any new developments from the Assassin’s Creed production, but Fassbender was quick to shoot down rumors that he’d left the project, revealing that the script is still in the works and that he was due to meet with the writers again soon. You know, we absolutely want to respect the game. There’s so much cool stuff in the game that we’re actually spoiled for choice in terms of what we can use and what we can’t, but we also want to bring new elements to it and perhaps our own version of things that already exist in the game. But we’re definitely making a feature film, and we’re approaching it as a feature film, as opposed to approaching it as a video game. The Assassin’s Creed present quite a challenge for the screenwriters, even beyond the fundamental differences between the interactive fiction of gaming and the more passive variety of movies. The AC series unfolds across multiple settings and time periods, within a frame story involving a bartender named Desmond Miles who is kidnapped by a nefarious corporation that has developed a means to relive the past by accessing “genetic memory.” We’ve seen the franchise explore several of Desmond’s ancestors in the centuries-long war between the Assassins (big fans of free will and choice) and the Templars (who believe mankind needs to be controlled by the elite, for their own good), with storylines set in the Crusades-era Middle East, Renaissance Italy, and Revolutionary America, among others. There’s also an overarching mythology about a precursor species that was wiped out millennia ago, leaving behind powerful artifacts and warnings about a coming apocalypse Desmond soon finds himself trying to prevent. I love the world. I don’t really play that many video games, but when I met up with the guys from Ubisoft and they started to explain this whole world and the idea of DNA memory — you know, I think it’s a very feasible scientific theory. I just thought, ‘This is so rich,’ and about the possibility of it being this cinematic experience. So I’m really excited about it, and we’re working very hard to make sure that we’ve got the best and most exciting, original package. The Assassin’s Creed movie is currently slated for release next summer, on August 7, 2015. If you’re a fan of the games, you should have plenty to hold you over until then thanks to the two AC games releasing this fall. Assassin’s Creed: Unity will have players climbing the spires Revolutionary France on the next-gen consoles, and Assassin’s Creed: Rogue will let you play for the opposite team as a Templar on the old reliable Xbox 360 and Playstation 3. Unity invites you to begin stabbing rich French people in the face on October 28, and Rogue will hit shelves on November 11.